Naresh Goyal can offer an expression of interest in Jet's debt resolution plan and has a remote chance of returning to controlling role but will have uphill task convincing lenders to ignore possible objections of Etihad. 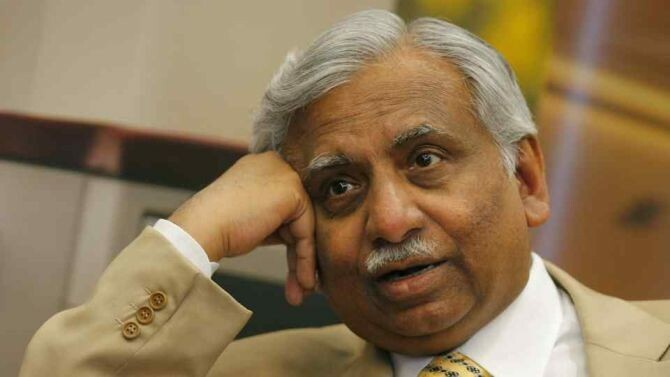 Jet Airways founder Naresh Goyal still has an outside chance of returning to the helm of the debt-laden airline, aviation sources say, as the window for submission of expression of interest (EoI) for the stricken airline's debt resolution plan is set to close on Friday. Though the EoI is non-binding, Goyal, who stepped down last month as chairman under lenders' pressure, will have to convince the consortium that has formulated a debt resolution plan of the viability of his recapitalisation proposals. The Jet board with Goyal at the helm had given its assent to the proposal of the lenders' consortium led by the State Bank of India (SBI) for a debt-equity swap to rescue the troubled airline. The rescue plan for the airline weighed down by a debt burden of Rs 8,500 crore requires bringing in additional funds of at least Rs 1,200 crore immediately to keep the airline afloat. Goyal still holds 51 per cent stake in the airline and a Supreme Court order striking down a Reserve Bank of India (RBI) notification on stressed companies limits the lenders' freedom to effect a debt-equity swap. "Goyal is keen on submitting an EoI but is yet to take a final decision. If he does, he will submit alone and not in a partnership," a media report said quoting an unnamed airline source familiar with the development. The condition that any entity can submit an EoI is cited as a factor in favour of Goyal's bid. Though such entities can submit the offers individually, there is nothing preventing them from forming a consortium to make the rescue plan implementation viable, according to sources. This condition will help Goyal rustle up support among the new investors. However, the biggest impediment to Goyal's return to a controlling role in the airline would be the active proposal of United Arab Emirates (UAE) national carrier Etihad Airways that submitted its EoI on Thursday. Etihad with 24 per cent stake is the second largest shareholder in Jet after Goyal's 51 per cent holding. However, under the debt resolution plan, the lenders now control 32.1 per cent stake and Goyal's offer to pledge about 42 per cent stake in return for Rs 1,500 crore recapitalisation can push up their holding to about 75 per cent, which the consortium is prepared to offer to the new investor. Though the lenders have consented to Goyal retaining about nine per cent stake, any management role is likely to get torpedoed by Etihad. Etihad's point man for the Jet deal is Cramer Ball, who served as a subordinate to Goyal in the role of Jet CEO from May 2014 to December 2015. Ball, who is piloting Etihad's involvement in the Jet rescue plan, apparently had a difficult relationship with Goyal before he finally stepped down. There are reports Etihad may enter into tie-ups with some of the private equity firms that have shown interest in the rescue plan. In such a case, Goyal could be fully shut out of such a plan. Time is the essence of the success of any rescue plan as the stricken airline is flying on borrowed time. Jet, on Thursday, stopped flying on international routes as its fleet size has shrunken to a dismal 20 aircraft from the original 120, sources say, as leasing companies have repossessed aircraft over the payment defaults. Aviation regulator Director General of Civil Aviation (DGCA) has been busy de-registering aircraft leased to Jet to allow them to been flown out of the country for induction elsewhere. Oil marketing companies have begun to pull the plug over non-payment of dues with the Indian Oil Corporation (IOC) stopping aviation turbine fuel (ATF) deliveries from Wednesday.